Glaciers in the high mountain regions of the Himalayas offer a different picture to our Alpine glaciers: many of them are completely covered in debris, and many areas are overlooked by steep ice walls – vertical cliffs up to 30 metres high. From a distance, this makes the glacier surface look like the warty skin of a toad. Researchers had previously assumed that the insulating debris protects the ice from direct solar radiation, thereby slowing down the melting of the underlying ice. However, satellite measurements show that debris-covered glaciers in the Himalayas might lose mass as quickly as debris-free glaciers. Multiple studies suggest that ice cliffs could be responsible for a large part of the high volume loss, as alongside the insulating debris, another characteristic feature of high-altitude Himalayan glaciers is steep ice walls up to 30 metres high. Researchers now suspect that these ice cliffs convey large quantities of atmospheric heat into the ice and so contribute to glacier melt. As part of an international research project, former ETH doctoral student Pascal Buri went to the Langtang Valley in Nepal and used a computer model to closely examine the formation and decline of ice cliffs and their influence on the melting of debris-covered glaciers. The study has just been published in the journal PNAS. 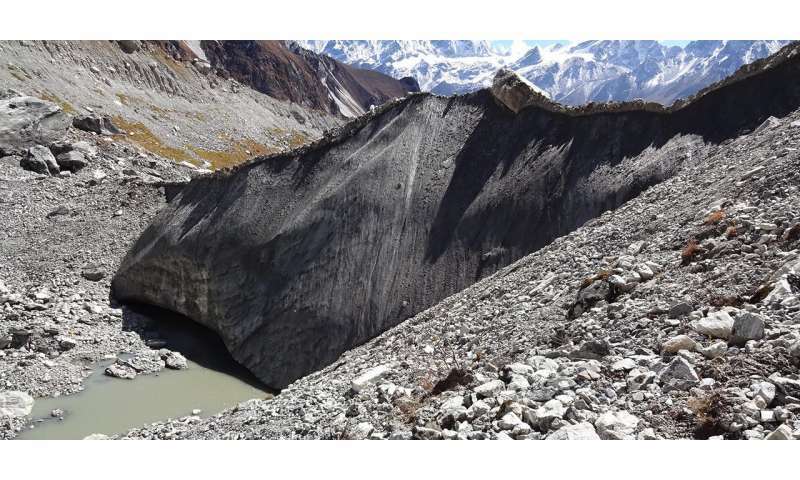 Buri's simulations and measured data confirm the suspicion that ice cliffs do contribute significantly to the melting of debris-covered Himalayan glaciers, particularly north-facing ice cliffs. This seems at first to be a paradox: south-facing cliffs receive much more direct solar radiation than north-facing ones. However, this increased exposure to sunlight means they disappear more quickly than north-facing ice cliffs. South-facing cliffs melt irregularly. The upper section, which receives more sunlight, melts quickly, while the more shaded lower section melts less and more slowly. The ice cliff thus becomes increasingly flat, and once it reaches a slope of about 35 degrees, debris reburies it, covering it and gradually shielding it from the sun. North-facing cliffs, however, melt at similar rates throughout, so the steep face remains for longer. Heat radiating from the surrounding debris and that of the air is transferred into the ice. This contributes significantly to the melting process. These results are a first step towards large-scale evaluations of volume loss of debris-covered glaciers. "There are many glaciers in Asia and worldwide with often extensive debris cover, so a better understanding of their persistence are very important," says Buri. "We should also consider the fact that Himalayan glaciers provide water for millions of people e.g. in India, Pakistan and Bangladesh."